Danielle Carlacci and Reynaldo Piniella trrade insults in the Rep Studio production of “I And You.” Photo by Jerry Naunheim, Jr. 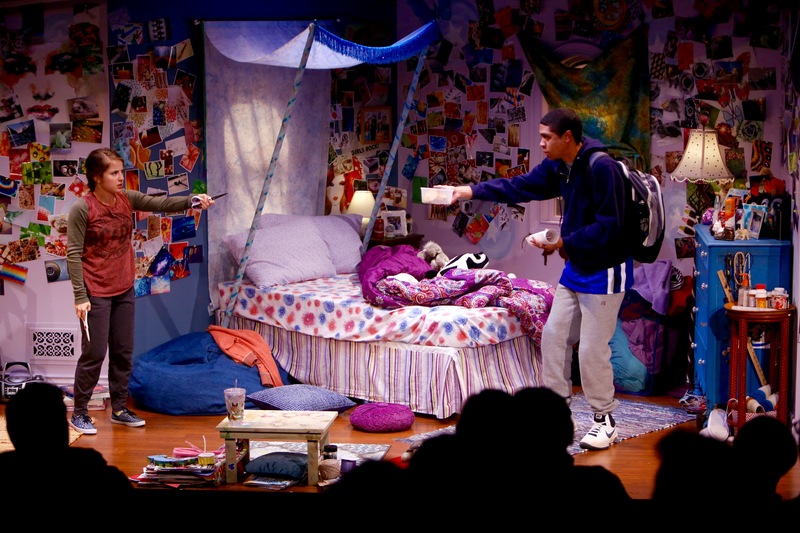 Many productions have offered unexpected and memorable moments in the history of the Studio Theatre at the Repertory Theatre of St. Louis but “I And You” is very special indeed. It touches our hearts, draws us into two endearing characters and then gives us an ending that blows us away and leaves us sobbing like babies- once we realize what a bombshell has just hit us in the gut. 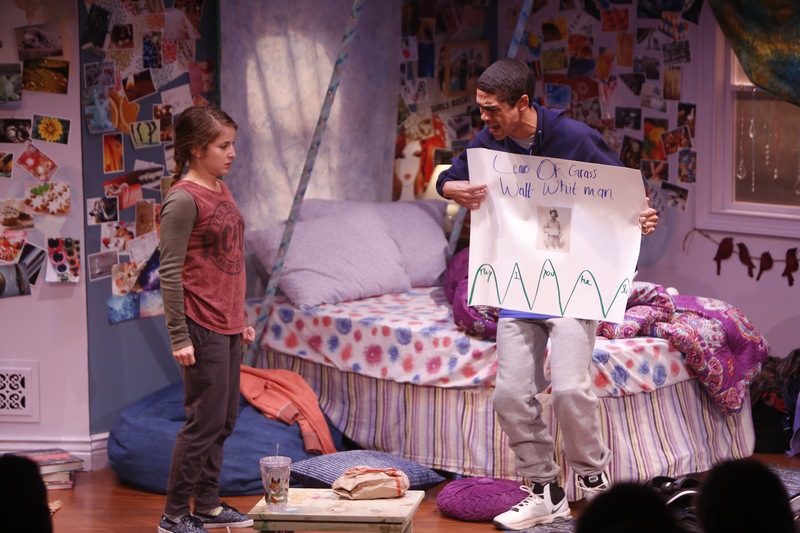 Reynaldo Piniella as Anthony shows his pathetic poster to Danielle Carlacci as Caroline in “I And You” at the Rep Studio. Photo by Jerry Naunheim, Jr. The Lauren Gunderson script grabs us by the heartstrings immediately as we meet Caroline in her outrageously, teenage chic bedroom in the renovated attic space of her home. Danielle Carlaccci is a petite and feisty young girl who we soon learn has been schooled at home while enrolled at a local high school. Suffering from a liver ailment that requires a transplant, she has grown cynical and lacks certain social skills from being on her own for some time. She texts her mother instead of actually going to the lower part of the house- even to eat meals. Carlacci draws us immediately into her spunky, jaded character buoyed by her life-long frustration. 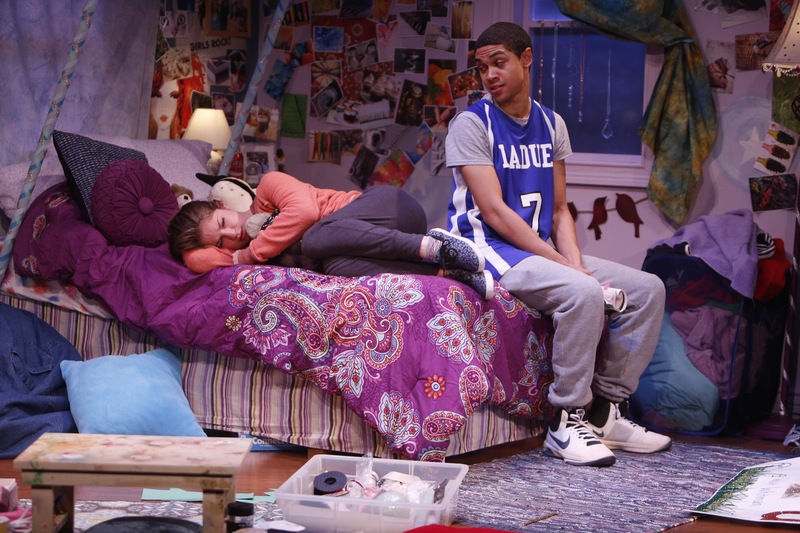 Caroline takes ill as Anthony tries to talk her down during “I And You” at the Rep Studio. Photo- Jerry Naunheim, Jr. Unexpectedly, a young man enters her sacred space, claiming her mother sent him up with the school project he volunteered to work on with her. It’s a piece on Walt Whitman’s “Leaves of Grass,” in particular the powerful “Song Of Myself.” Reynaldo Piniella’s Anthony is a long and lanky foil to the suspicious Caroline. His love of poetry, jazz and basketball become the basis for him breaking down her barriers. Showing her his pitiful poster to be used as a visual aid in their presentation soon piques her interest and she gets involved in her favorite hobby, crafting. The two soon begin to communicate and reach an understanding that eventually leads to something resembling a friendship bordering on love. 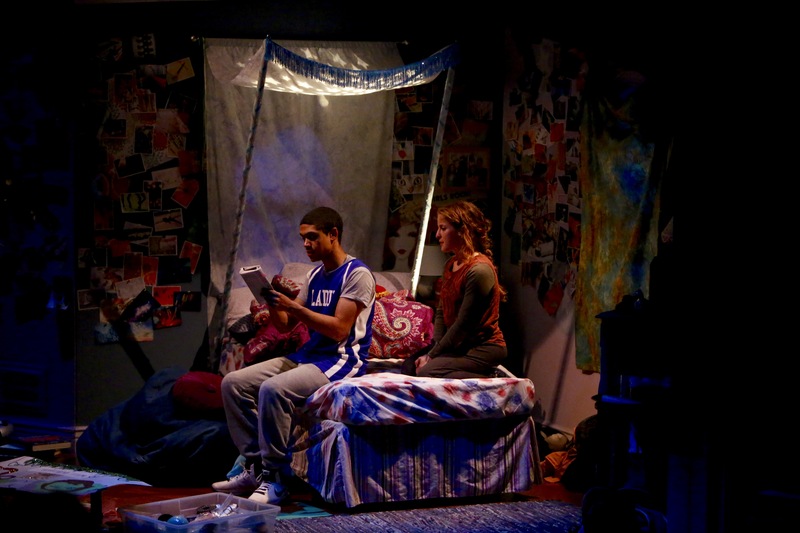 Caroline gets into the poster while Anthony reads the poem in the Rep Studio production of “I And You.” Photo- Jerry Naunheim, Jr.
Then Gunderson’s script takes us into that final moment that makes this delightful one act transcend into something quite remarkable. It explores issues that turn us inside out and leaves us looking for the number of the bus that just hit us. Director Jane Page has guided her talented cast into this story with all the plausibility of the teenage story of angst and blossoming relationships. She is assisted by the wonderful set design of Eric Barker that allows us into this special world of a teenage girl and the beautifully lit design of John Wylie. Marci Franklin’s costumes and the sound design of Rusty Wandall complete the magic. A magical moment during “I And You” at the Rep Studio. Photo- Jerry Naunheim, Jr. The real story, of course, is the script that takes us on a very special journey that makes you realize how powerful life can be and, in doing so, how powerful theatre can be. 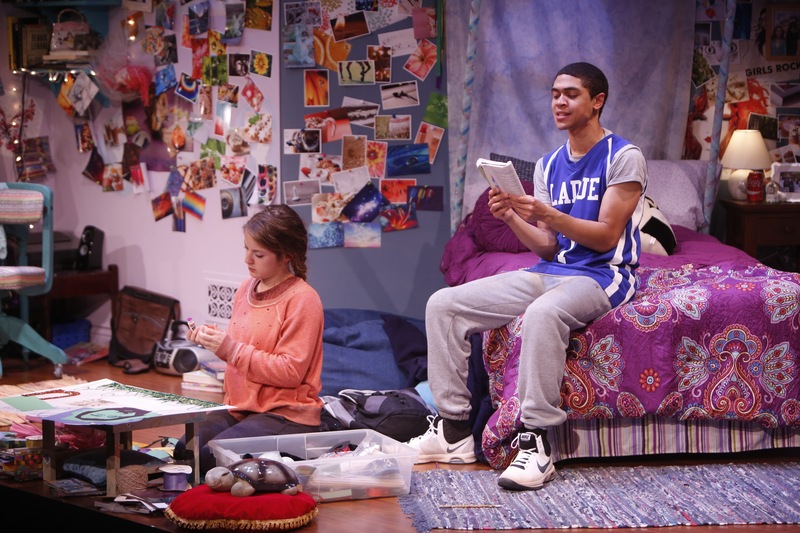 Be sure to see “I And You” at the Rep Studio through November 15th. Call them at 314-968-4925 for tickets or more information. This entry was posted on November 6, 2015 at 9:43 am11 and is filed under Uncategorized. You can follow any responses to this entry through the RSS 2.0 feed. You can leave a response, or trackback from your own site.